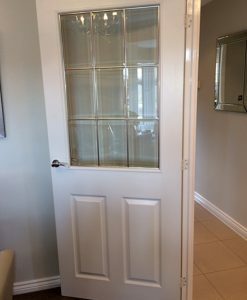 Our half glazed internal pre-finished doors have a unique design of 9 glass panels. – The glass is exclusively produced in Canada and beveled on all four edges to create a beautiful finish. – These doors are pre-finished in the factory so would not require any further painting. This door is only available with a factory fitted standard latch. – These doors feature the unique hinge system designed and produced by National Hickman. 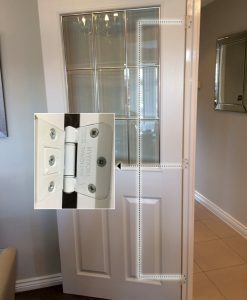 *Although these doors have the unique hinge system and latches fitted, we can supply the same doors without these fittings. Please contact us for further information. We stock and supply National Hickman doors and accessories to the public and trade. We also supply timber, sheet materials, decking, mdf linings and architrave. We deliver to Mainland UK. A choice of delivery options is available.